The chant means little to people who are unfamiliar with the history of Muhammad’s religion, yet it needs to be understood because it is a chilling reminder of one of the major atrocities he committed against the Jews when he attacked their oasis of Khaybar. People who chant these words today do so to warn Jews that they intend to repeat Muhammad’s horrors against them — and everyone else who is not a believer for that matter. 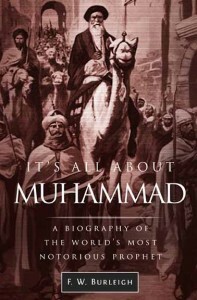 Like everything involving the Muhammad story, there is a complex background, but here it is in condensed form: The attack on Khaybar, a wealthy date-producing valley 90 miles north of Yathrib (Medina), was part of a broader strategy Muhammad had devised to subjugate all of Arabia, and the key to pulling it off involved neutralizing the Meccans, his chief enemies, 230 miles to the south with whom he had fought several major battles. The last was the battle of the Trench (A.D. 627), a failed Meccan attack on Muhammad’s stronghold in Yathrib. THE RUINS OF ONE OF THE KHAYBAR FORTRESSES. An agricultural oasis in a serpentine valley flanked by ancient lava beds, Khaybar was known as the date farm of Arabia. One of the plantations was reputed to have 40,000 trees. 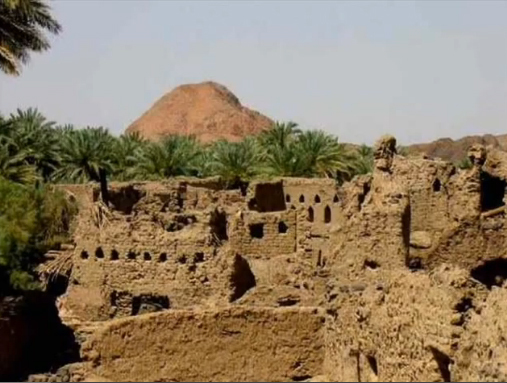 Muhammad attacked the oasis in order to seize the wealth of the Jews, but also out of hatred for them for rejecting him and his religion and to eliminate them as a military threat. His followers, who had anticipated entering Mecca as pilgrims, were upset they would not finish the pilgrimage, but Muhammad offered them a carrot as well. In several verses of a newly crafted Koran chapter called “Victory” that dealt with the aborted pilgrimage and the Hudaybiyya arrangement, he promised them booty galore in the near future, but without specifying the source of the plunder. That turned out to be the Jewish oasis of Khaybar. 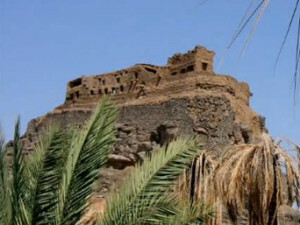 ZUBAYR’S CASTLE WAS ONE OF THE FIRST of the Khaybar fortresses that Muhammad captured. The castle was thought to be impregnable because of its location at the top of a steep mount, but Muhammad discovered its water source, a spring that flowed under the mount that could reached from the castle. He diverted the spring and when they ran out of water, the defenders fell back to another fortress. Muhammad wanted to attack Khaybar for several reasons. The first is that he feared the Jews were forming a coalition of northern tribes to attack him in Yathrib, just as the Meccans had recently attempted, but he also wanted their wealth. 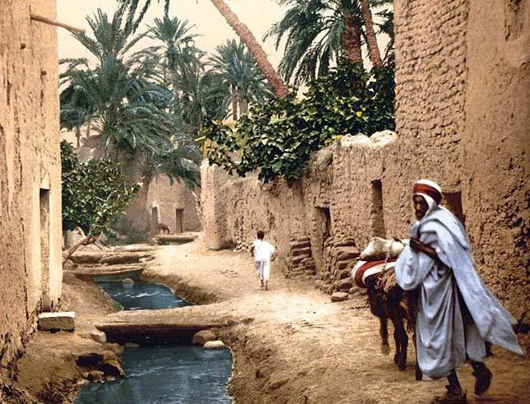 The Jews were industrious and their valley was known as the date farm of Arabia. One of their date plantations reputedly had 40,000 trees. He led the 1,400 believers — the most faithful of the faithful who had accompanied him on the pilgrimage to Mecca — to conquer Khaybar and take its wealth. Underlying this was his seething hatred for the Jews for their refusal to accept him as their prophet and adopt his religion. Khaybar consisted of a string of fortresses in several clusters spread through a long, narrow valley between ancient lava beds. When Muhammad’s raiders poured into the valley, rather than confront them as a unified force, the Jews fell back to their various fortresses. 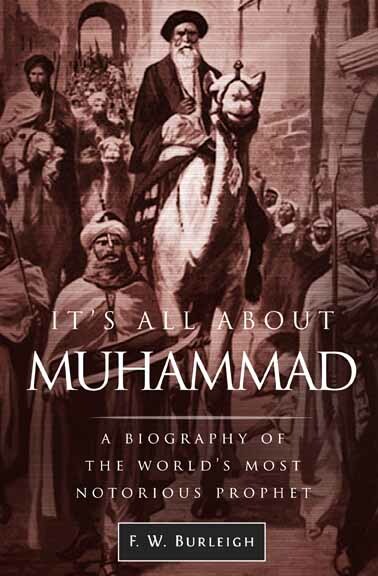 Muhammad conquered them one at a time. Seeing they would not prevail against him, the remaining fortresses negotiated their surrender. 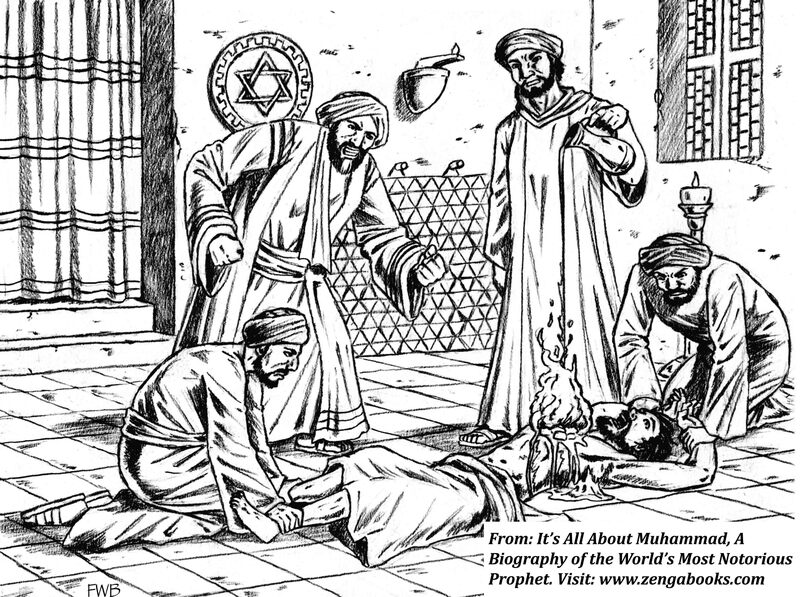 MUHAMMAD INTERROGATES KINANA, the leader of the Nadir Jews of Khaybar, while one of his men pours lamp oil onto a fire that was started on his chest. 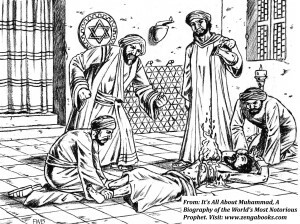 Muhammad tortured him so that he would reveal the whereabouts of tribal treasures he had withheld that included gold and silver dinnerware, precious stones and ornaments, and other valuables. Despite the torture, Kinana refused to tell him, and Muhammad had his head cut off. The Khaybar Jews hoped to avoid annihilation by working out a deal with Muhammad whereby they would turn over all of their wealth to him if he allowed them to leave. 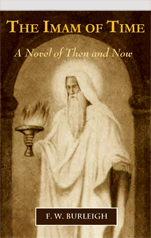 The Nadir leader, a rabbi named Kinana, made the mistake of hiding the gold, silver, and jewelry of the tribe, hoping to have something to start over with if they were expelled from Khaybar. Muhammad discovered Kinana was holding out on him and tortured him to reveal where these treasures had been hidden, but when Kinana refused to tell him, Muhammad had his head cut off. He enslaved the women and distributed them among his loyalists and chose the prettiest for himself. This happened to be the 17-year-old wife of Kinana. She was led through a palm grove along a path where the head and torso of her husband had been dumped and was brought before Muhammad, who wanted to check out rumors of her beauty. He proposed to her then and there. Her freedom was her dowry if she married him. MUHAMMAD TAKES SAFFIYA AS HIS WIFE. 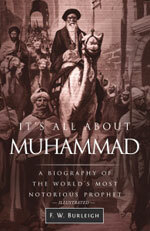 Following the torture and beheading of Kinana, Muhammad forced his benumbed widow, a seventeen-year-old woman, into marriage. He was told of her beauty and had her brought before him. He proposed to her while the headless body of her husband lay in a palm grove nearby, promising her freedom if she married him and adopted his religion. Muhammad cast the blame on the Jews. Allah had commissioned him as the “last and final messenger” to bring truth to the world, but the Jews had rejected truth and therefore Allah inflicted punishment on them. He was the instrument of Allah’s punishment. With such rationalizations, this self-declared “Messenger of God” lined his pockets and that of his followers and spread his cult ever farther into Arabia. You too live in Khaybar. Ibn Ishaq, The Life of Muhammad, trans. A. Guillaume, pp. 499-507. This article was first published by American Thinker. It may be used in whole or in part provided the following attribution is given: F. W. Burleigh is the author of It’s All About Muhammad, a Biography of the World’s Most Notorious Prophet. He blogs at www.itsallaboutmuhammad.com.